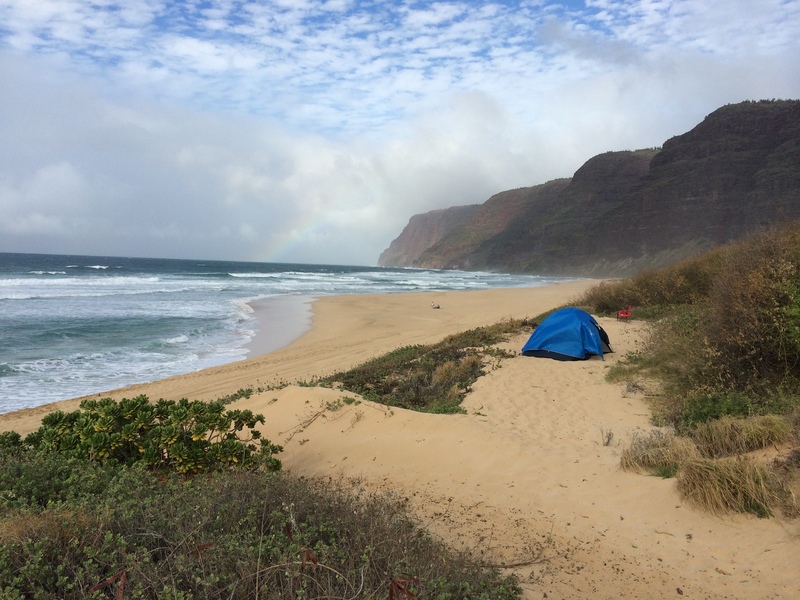 Did you know that you can camp in Hawaii? Our family just returned from 4 weeks in Hawaii and almost 3 of those weeks were spent camping on Kauai. We’ve been to the island many times and love our time there. However, we have always wished for more time. Part of the constraint has always been work and school but mostly money. It’s expensive to stay on any of the Hawaiian islands especially if you want a view of the water. You can easily pay $200-300 a night. Even with a VRBO or airbnb rental for ocean view it is at least $150. Last time I checked 4 weeks at even $150 a night is over $4,000 just for a place to sleep. That is simply not in our budget. However on our last visit to the island we really looked at the county and state parks and all the folks camping there. When we returned home we looked it up and you know what? It’s only $6 a night for our entire family to camp at the county parks on Kauai. 4 weeks at $6 a night? $168. That is practically FREE! The idea of basically free accommodations stuck with us for an entire year. So this year we decided to try it out. We embraced the idea of camping and being sandy and a little grubby around the edges packed up our bags, tent and sleeping bags and headed to the island for 4 weeks. It was FABULOUS! We had spectacular weather which helped but we also had an open mind. We loved the intimate quality of camping on the beach. Of waking up to hearing the waves crashing, to eating our dinner sitting in the sand watching the sunset and yes brushing off our air mattresses each night of the sand that had snuck its way into the tent. (surprisingly though we really didn’t end up with that much sand inside the tent!) We rented a VRBO condo over Christmas that had a washer and dryer which was a nice break from the camping and a great way to regroup. We had to buy a few things at walmart- like the air mattresses and some pillows which were not cost effective to haul on the plane with the baggage fees and we had 6 checked bags in total (one of which was an ice-chest). So all in all for three weeks of camping it cost us $168 to camp plus another $300 in baggage fees/ gear costs- some of which we recouped by selling our stuff that we had purchased at the end of the trip. Not too shabby! We will definitely be camping in Hawaii again, and again and again!